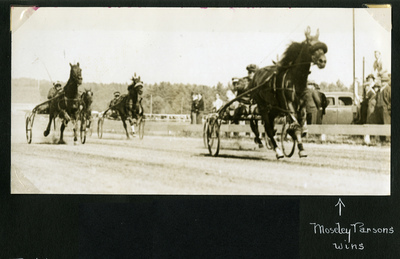 Black and white action photograph of bay gelding, Mosely Parsons wearing head number four, Carney up, approaching the finish line in the first heat of the Classified Pace on Thursday, September 23, 1937, at the Cumberland Fair, West Cumberland, Maine. Bay gelding, Kalumuch Direct, Phalen up, finished the heat in second place. Black gelding, Roy Directum, Tuttle up, crossed the line in third place.